Explaining how to best "tube" a cria should the cria refuse a bottle and/or not have a suckle reflex. 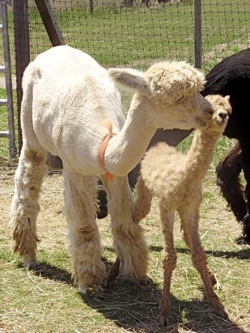 Our alpaca Neonatal Clinic is comprised of a morning of lecture with power-point presentations, and an afternoon of hands-on “wet lab” for each registrant. The morning lecture covers female reproduction/breeding; reproductive anatomy and physiology, breeding and pregnancy diagnosis options, gestational development, care of the pregnant dam, normal and abnormal criation and care of the newborn as well as the high-risk cria. If you are interested in attending a future Birthing/Neonatal Clinic, please let us know, and we can contact you when the next clinic is scheduled! It is tentatively scheduled for April 2013. Reserve your space early, as 2012 was a full class! Course-book, breakfast and lunch provided. Class size limited to optimize learning. 9:30 am-6:00 pm. $200, and $150 for additional participants from the same farm. (Repeat a class, for just $100) The price of the workshop is refundable should the attendee purchase alpacas or breedings to any of Island Alpaca fully-owned herd sires.